Rite of Beatification: What are they saying? The following is an unofficial English translation of the Rite of Beatification of John Paul II, pronounced moments ago in St. Peter's Square. Beatissimo Padre, il Vicario Generale di Vostra Santità per la Diocesi di Roma domanda umilmente alla Santità Vostra di voler iscrivere nel numero dei Beati il Venerabile Servo di Dio Giovanni Paolo II, papa. 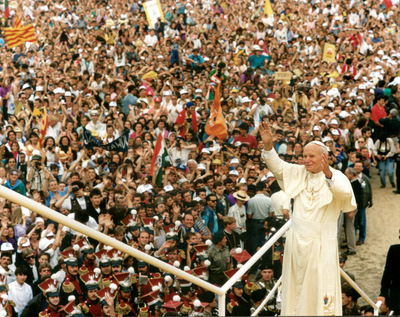 Holy Father, the Vicar General of your Holiness for the Diocese of Rome, humbly requests that the Venerable Servant of God John Paul II, Pope, be numbered among the blessed. Noi, accogliendo il desiderio del Nostro Fratello Agostino Cardinale Vallini, Nostro Vicario Generale per la Diocesi di Roma, di molti altri Fratelli nell’Episcopato e di molti fedeli, dopo aver avuto il parere della Congregazione delle Cause dei Santi, con la Nostra Autorità Apostolica concediamo che il Venerabile Servo di Dio Giovanni Paolo II, papa, d’ora in poi sia chiamato Beato e che si possa celebrare la sua festa nei luoghi e secondo le regole stabilite dal diritto, ogni anno il 22 ottobre. Nel nome del Padre e del Figlio e dello Spirito Santo. We, welcoming the desire of our brother Cardinal Augostino Vallini, our Vicar General for the Diocese of Rome, our brother Bishops and many lay faithful, after hearing the opinion of the Congregation for the Causes of Saints, by our apostolic authority we declare that the venerable Servant of God John Paul II, Pope, henceforth shall be called Blessed and that his feast shall be celebrated every year of the 22 of October, in the places and according to the norms established by Church law. In the name of the Father, and of the Son, and of the Holy Spirit. Amen. Beatissimo Padre, il Vicario Generale di Vostra Santità per la Diocesi di Roma ringrazia la Santità Vostra per aver oggi proclamato Beato il Venerabile Servo di Dio Giovanni Paolo II, papa. Holy Father, the Vicar General of your Holiness for the the Diocese of Rome thanks your Holiness for proclaiming today the Venerable Servant of God John Paul II, Pope, as blessed.